Fig. 1. 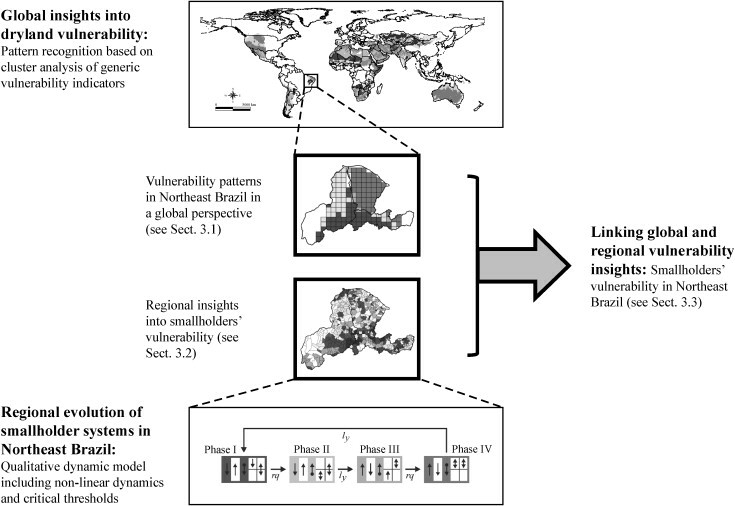 Methodological approach used in this study to refining global vulnerability insights at a regional scale. Global analyses of vulnerability reveal generic insights into the relation between socio-ecological systems and the stress impacting upon them including climate and market variability. They thus provide a valuable basis for better understanding and comparing the evolution of socio-ecological systems from a broad perspective. However, even when reflecting sub-national differences, global assessments necessarily aggregate regional variations in the underlying conditions of vulnerability. Refinements are therefore necessary to better accommodate context-specific processes and hence facilitate vulnerability reduction. This study presents a novel methodology to refining global insights into vulnerability at a regional scale. It is based on a spatially explicit link between broad patterns of vulnerability and modelled regional smallholder development. Its application in order to better represent the drylands of Northeast Brazil reveals specific facets of smallholders’ vulnerability at the municipio level, reflecting non-linear dynamics. The results show that smallholders’ vulnerability was widely exacerbated in the most vulnerable areas. One key mechanism causing such a vulnerability increase involved intensifying resource degradation and the related potential for impoverishment as modelled at the regional scale. In addition, by subsequently re-orienting their livelihoods towards off-farm activities, smallholders became more sensitive to fluctuations and competition in the labour market. In contrast to these critical trends, living and environmental conditions improved in only some areas, thus indicating a decrease in vulnerability. Altogether, in differentiating the heterogeneity of resource management and smallholders’ livelihoods, the regional refinement presented in this study indicates necessary adjustments to generic strategies for vulnerability reduction gained at the global scale. This peer-reviewed article is available to download from the right-hand column of this page.